In 1988, there was an uproar when it was announced that Vancouver’s much-loved, 60 year-old Georgia Medical Dental Building would be demolished. Although the building was clearly unfit for restoration, Vancouverites were concerned about the aesthetic changes to one of the city’s most high-profile intersections. In retrospect, they needn’t have worried. 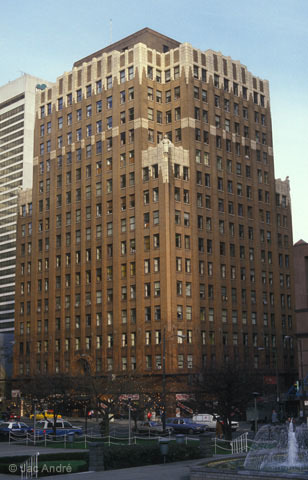 Cathedral Place is now one of the most beautiful buildings in the city. The 23-storey structure, the most expensive and finely-detailed building ever constructed in Vancouver, is the result of the efforts of three men: owner Ron Shon, architect Paul Merrick and Bill Rooney, vice-president of the Shon Group. Matching the local architecture was a challenge. Behind Cathedral Place, to the north, lies the luxurious (pink) Park Place high-rise office building. To the east is the equally sleek head office of the Hongkong Bank. On the southeast corner sits the majestic Vancouver Art Gallery, which was built in 1906 as Vancouver’s Courthouse. Directly to the south, is Canadian Pacific’s grand Hotel Vancouver, built in 1941. 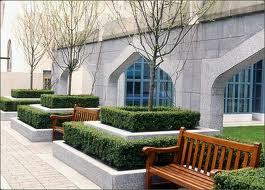 And directly to the west is Christ Church Cathedral, which was built in 1888. Merrick met the challenge by beginning with the building’s materials. 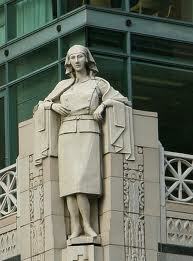 One of the most upsetting aspects of the Georgia Medical Dental Building’s demolition, to heritage buffs, was the loss of its terra cotta trim, which included three terra cotta nurses. In fact, the nurses had become dangerously unstable and would have had to be removed even if the building had remained. The Shon Group didn’t dispose of the terra cotta. The nurses and trim were donated to the Vancouver Museum, which keeps the nurses and half the trim in its collection—the other half was auctioned off to the public. Then, the nurses and trim were reproduced for the new building. Another important aspect of matching the neighbourhood was the colour of the Cathedral Place trim—the Hotel Vancouver is famous for its peaked turquoise roof. So Merrick gave Cathedral Place blue-green windows and a blue-green peaked roof. “The windows are meant to seem like picture windows, although they were designed to take partitioning at the standard five-foot intervals,” continues Merrick. “There are nine-foot ceilings and we thought of putting in opening windows, but that meant more aggravation and an additional $800,000. We went with non-reflective glass which cuts glare without making the day look dull, and the colour works well in this climate. Merrick had other instructions. The interior of the building was to be appropriate to the market—centre core with a respectable core-to-wall distance, no intrusive interior columns, and a smart building with good-quality services and environmental control systems. Nothing too exotic. This criteria was met. The building is 360,000 square feet of office space, with one floor of commercial. There is a four-storey, 360-vehicle underground parking lot, and each office is finished according to tenant specifications. 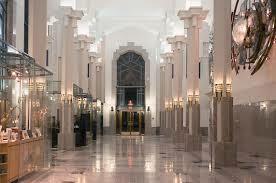 The columns were integrated into the walls and the building runs on high-tech management systems. 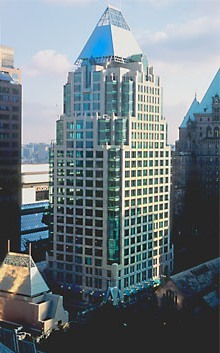 Cathedral Place uses Johnson Controls’ Metasys computer control system, which permits the highest possible ventilation rate. The General Electric Total Lighting Control system allows for individualized energy efficiency, and the S.I.S. Pentagon 2000 security system combines on-site personnel with programmed Wiegand cards and central lock-down capabilities. 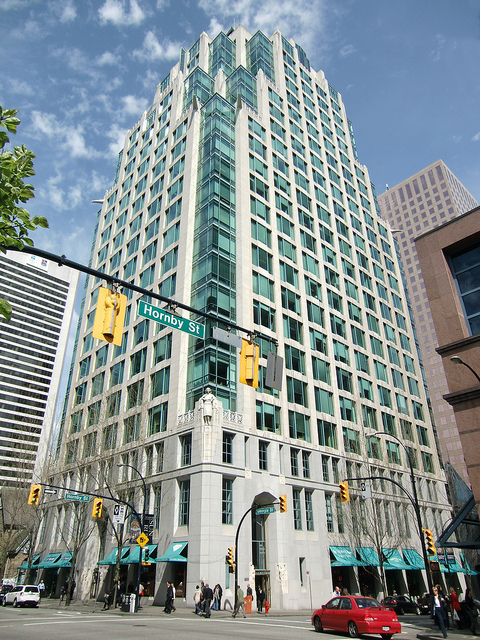 The Shon Group wanted Cathedral Place to match the Hotel Vancouver in another way—in the area of ground-floor activity. The first floor of Cathedral Place houses a jewellery store, a travel agency, a florist, House of Brussels Chocolates, a boutique, a bank, two cafes, a stationers and the Sri Lankan Gem Museum. Perhaps most importantly, there is another museum attached to it—the Canadian Craft Museum. That added a new wrinkle to the development. “Originally, the whole property was going to be covered with office space,” says Bill Rooney. “But we wanted the highest-quality structure. So we arranged a density transfer with the city. In exchange for building the new Canadian Craft Museum to the north, we were given a density bonus—additional floors. 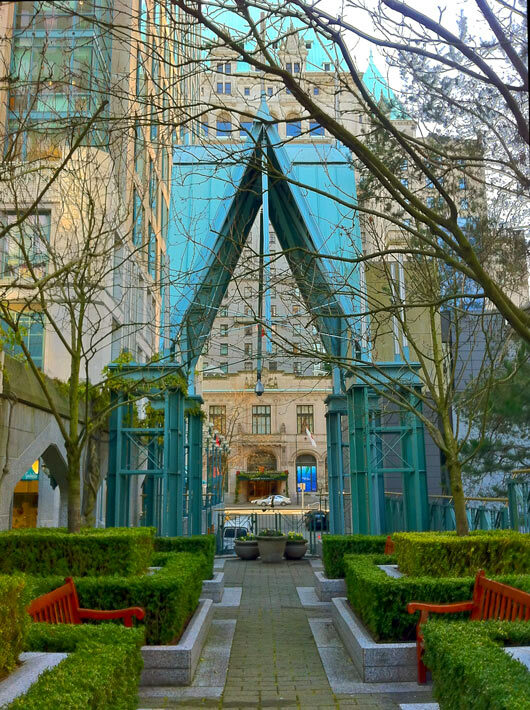 Merrick did a superb job of designing the 20,000 square-foot museum and the courtyard which separates the two buildings—there is now an elegant, classic sanctuary in the middle of Vancouver’s bustling downtown core. One of the more unusual things about the Cathedral Place is long gone, but it certainly raised the profile of the building: the site’s $40,000 construction hoarding. It was created by Design Works Inc., and no Canadian city had ever seen anything like it: a 3-D custom-designed architect’s board, complete with huge pencils, giant rulers and an enormous business card (with paper clip), from the leasing agent.